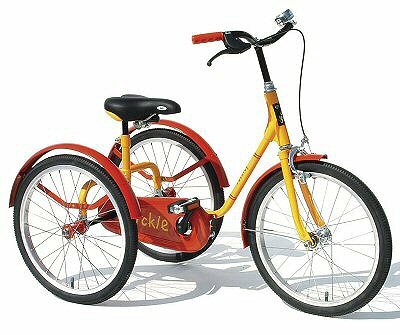 The Pickle children's Bicycle in Yellow & Red from Pashley Cycles is one of the best traditional children's bicycles in the world, combining classic styling with the best materials and high quality craftsmanship. A children's tricycle like no other, this hand made gem captures the spirit of childhood in a timeless and durable package. What better way for children to enjoy their first wheeled adventures than on a machine that is reassuringly stable and great fun to ride. Made from the finest materials and components this classic tricycle will take everything in it’s stride giving you and your family many years of happy memories. To protect inquisitive little hands from the chain and gears the Pickle is fitted with a fully enclosed chain case. The chain case also seals out dirt and water reducing wear on the components and time spent maintaining the tricycle. The Pickle is fitted with a childrens specific saddle on a hand crafted L shaped seat post. The posts unique shape allows the bike to be adjusted to fit as your child grows. Combined with an adjustable reach brake lever the Pickle is perfect for those early cycling experiences. 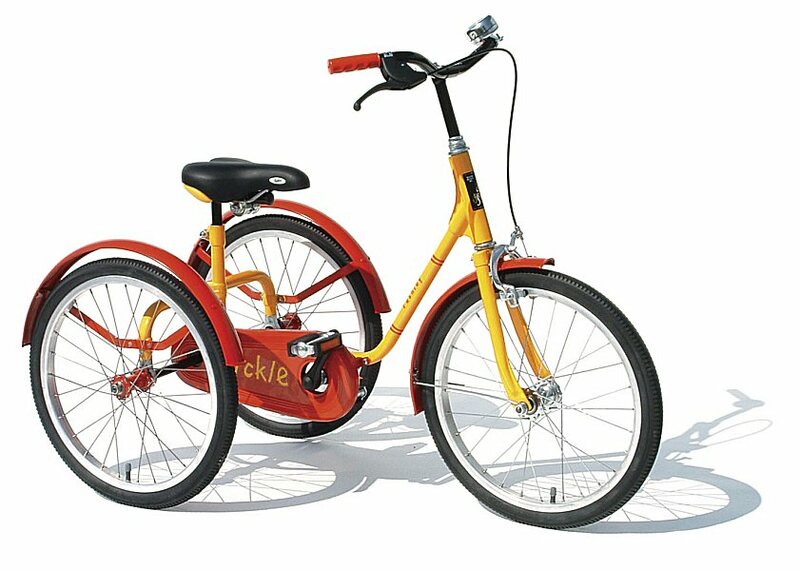 The Pickle has a traditionally lugged and brazed steel tricycle frame, single speed freewheel and front alloy caliper brake. All our Pashley bicycles are painstakingly hand built by extremely qualified and experienced craftsmen in Stratford-upon-Avon. It is this commitment, attention to detail and hand built quality that has earned Pashley its enviable position as Britain’s most exclusive cycle manufacturer. We warmly recommend our Pashley bicycles to anyone simply looking for the very best. Suitable for inside leg 17” - 21” (3-8 yrs old). A childrens tricycle like no other, this hand made gem captures the spirit of childhood in a timeless and durable package. What better way for children to enjoy their first wheeled adventures than on a machine that is reassuringly stable and great fun to ride. Made from the finest materials and components this classic tricycle will take everything in it’s stride giving you and your family many years of happy memories. To protect inquisitive little hands from the chain and gears the Pickle is fitted with a fully enclosed chain case. The chain case also seals out dirt and water reducing wear on the components and time spent maintaining the tricycle. The Pickle is fitted with a childrens specific saddle on a hand crafted L shaped seat post. The posts unique shape allows the bike to be adjusted to fit as your child grows. Combined with an adjustable reach brake lever the Pickle is perfect for those early cycling experiences. The Pickle has a traditionally lugged and brazed steel tricycle frame, single speed freewheel and front alloy caliper brake. Size: Suitable for inside leg 17" - 20.5"